When I was a junior in college, my friend Sylvia swore to me that she was in love and would never look at another guy again. Because she had said the same thing about her last 2 boyfriends, I didn’t believe her until I saw her change right before my eyes. She completely transformed into the female version of her new boyfriend, Gary. Over the course of 6 months, she gained a lot of weight from eating his favorite foods (deep-fried everything). She started dressing completely different. Instead of wearing her usual sweats and t-shirts to class, she wore mini-skirts and tanks. She even started talking differently. Whenever Gary was around, she did her best to hide the southern twang that she had all of her life. Duddenit became doesn’t it. At the beginning of a serious relationship, one of the hardest things to do is hold on to everything that makes you, you. Yet, it is one of the most important keys to your dating life. It helps you relate to people and it helps them get to know the real you. Then they can choose to love (or not love) you for who you are. If you define yourself using external factors, such as your financial status, friends, or a prestigious job, you will have no reason to get out of bed when those influences are no longer in your life. I have nothing against Sylvia’s change, but her motives for changing were all wrong. There’s nothing wrong with wearing mini-skirts if you actually like them. But if you’re ONLY wearing them because your new bae doesn’t want to be seen with a girl who wears sweats, then maybe he isn’t the bae for you. Your identity should be based on your abilities, what you like and what you aspire to—not what everyone else wants for you. Your personal love language. Imagine only being able to speak English while dating someone who only speaks Portuguese. He’s saying “I love you,” but you have no idea what he’s talking about. After a while, he simply gives up and tries to find someone who appreciates eu te amo.Whether you’re connecting with a parent, child, friend or romantic friend, everybody has a specific language that makes them feel loved. But not everyone knows what their love language is.According to Dr. Gary Chapman, there are 5 different love languages and everybody has at least 1 language that, when expressed properly, makes them feel loved. Knowing your love language can help your loved ones show you love in a way that you understand. Your personality type. Personalities are God-given traits that make us unique. Our uniqueness is often what attracts us to other people. You’ve heard it before, opposites attract. However, if you never learn to appreciate differences, opposites can also be really annoying after a while.For instance, when we were dating, I was fascinated by my husband’s love for jazz music, because it was different from anything that I had in my music collection. After a few years, I grew to like jazz but, unlike him, I don’t want to hear it every day, all day long. Annoying.When you understand the significance of personality types, it’s easy for you to be yourself and even easier for you to accept others and allow them to be themselves.So now, instead of judging his taste in music, I either tolerate it or use ear buds when I want to hear something else. Your Hobbies and passions. There’s nothing more attractive than a girl who has a life.Hobbies and passions are things that make your life interesting and make you interesting to talk to. They are outlets that give you balance, because all work and no play will make you go crazy. Don’t be that girl!If you’ve yet to find what you love doing outside of work, try different things to see which ones stick. Your deal breakers. Everyone should know what they want, need and like in a potential mate. But deal breakers are those things that you absolutely must have or else the relationship is over before it starts.For instance, if you are asthmatic, why would you tolerate a smoker? And if you find out that he smokes on your first date, why would you go out on a second date?Seriously, I know a lot of women who ended up in bad relationships because they either didn’t know what their deal breakers were or they ignored them in the beginning of the relationship—hoping they could change him.Deal breakers are not the same as compromises, so it’s important to get clear on what matters the most to you. 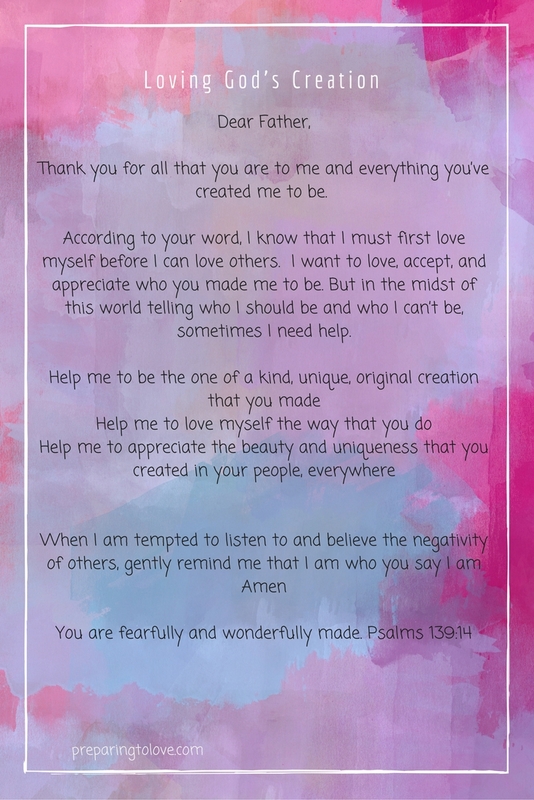 For those times when we need help remembering who you are, here is a prayer that you can print and tape to your mirror or your desk.